CocoaPods did not set the base configuration of your project because because your project already has a custom config set. In order for CocoaPods integration to work at all, please either set the base configurations of the target BluePlaquesLondonFramework to Pods/Target Support Files/Pods/Pods.debug.xcconfig or include the Pods/Target Support Files/Pods/Pods.debug.xcconfig in your build configuration. This probably sounds like a silly question, but how do I set the base configuration for a target? https://github.com/seanoshea/BluePlaquesLondon/blob/ios8/Podfile is the Podfile which is causing this issue. http://github.com/seanoshea/BluePlaquesLondon on the iOS 8 branch is the Podfile in question if you're curious to see what the project looks like. I had the same problem, but in Xcode 6.1.1 - what fixed it for me was to change the configuration file setting to None for the two Pods-related targets, then run pod install again. The configuration file setting is found by selecting the project (not the target) and then the Info tab. Go into XCode and open your project settings and under the Info tab, you will see "Configurations" where you can set a configuration file for both Debug and Release. You apparently have already set these to some custom config and CocoaPods wants/needs you to use the Pods config. In Configurations, select each one, one at a time (Debug, ApplicationUnitTest, Release, etc. ), and for each target within said configuration, set configuration to None. Make certain that Based on Configuration File reads 0 Configurations Set or No Configurations Set for each configuration. That is the crux. Once you have allowed pod install in step 7 to do it's magic, you may be able to use a custom config and change your configurations. That gives an error: [!] CocoaPods did not set the base configuration of your project because your project already has a custom config set. In order for CocoaPods integration to work at all, please either set the base configurations of the target `MyProject` to `Pods/Target Support Files/Pods-MyProject/Pods-MyProject.debug.xcconfig` or include the `Pods/Target Support Files/Pods-MyProject/Pods-MyProject.debug.xcconfig` in your build configuration. Go Project settings and click on Info tab. There will be an error where it cannot find the Configuration file. Set it to "None" for Debug and Release. Clean and build. This works. You also might need to delete libPods.a and libPods-app.a from the target dependencies, perform a clean and then run pod install again. that it had actually created the new xcconfig files that matched the new build configurations but for some reason I could not select these in the project target of my app. The line in the podfile that is generating a problem is : link_with ['BluePlaquesLondon', 'BluePlaquesLondonFramework']. If you added a custom build configuration to your existing project, Cocoapods will complain about it. Cocoapods will automatically create xcconfig files under the directory Pods/Target Support Files/<build_target> following the naming pattern Pods-<build_target>.<build_config>.xcconfig. Just make sure to manually add those files to your project in Xcode (under the Pods directory, but not inside the Pods project!). 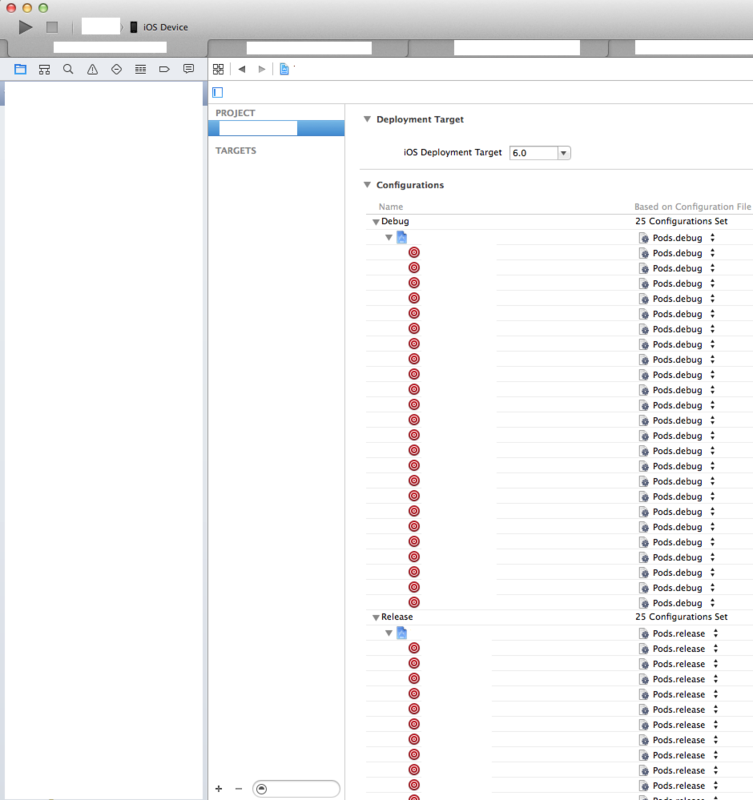 Once those files are included select your project in Xcode, go to the "Info" tab, and expand your custom configuration. Select the appropriate xcconfig file for each target under your custom configuration. Click on your target on the list and delete it with "-" sign on bottom of window. Click "+" to add target back to list. Choose correct target and name. After all everything should works. Add the relevent xcconfig files to your project. Cocoapods will have created them but you can't set them in Xcode until they are in the project. You probably want to add them to the Pods group where the other pods xcconfig files are. Right click and add files. For each target and configuration set the appropriate pods configuration. pod install again and you should see no errors. So for me, the problem was due to the aforementioned xcconfig files names being changed before the Swift 3 update took place. Something was out of sync, so Cocoapods created a 'Recovered References' folder section with the old named files, and linked to them. Everything was handled for me after then, and the warnings were gone. choosing Pods. (debug/release) Configuration Files from the combobox for the respective Configurations. Hope this will help someone. This happened to me because I already had a Pod configuration. I'm new on iOS development, was searching instructions to install Alamofire + SwiftyJSON and ended up installing the libraries more than once, inadvertently. To me, what worked was: on the folder "Target Support Files" in "Pods" project, I selected the two correct .xcconfig files and dragged them to the "Pods" folder of my app project. This enabled the selection of the correct config files on the base configuration. But then, if I run "pod install" again, the warning will change to the previous .xcconfig file. I try to delete the files and the old framework from the main project but when i ran the previous command once more, gave me the same warning, and created the file "Pods.framework" under the "Pods" folder of my app project. I ignored it, and it seems to be running ok, despite the two frameworks. I don't know if it's right, and a solution, if exists, it would be welcomed. diff: /../Podfile.lock: No such file or directory diff: /Manifest.lock: No such file or directory error: The sandbox is not in sync with the Podfile.lock. I pulled request from bitbucket for first time. I cleaned my project and tried everything(pod install, pod update etc.) but none of the above answer worked for me. Then I just check the path where I was installing the pod and corrected it and installed again,It just worked. Make sure give the path just before where .xcodeproj or .xcworkspace(if it is already there)exist. May be someone get benefitted from this. This would recreate everything and works always in minutes (not spending time to reverse engineer the "bug"). Not the answer you're looking for? Browse other questions tagged ios xcode cocoapods or ask your own question. When using cocoapods, what is the best way to change the PRODUCT_NAME? /Podfile.lock: No such file or directory - no solutions working? Incorrect path for Pods.debug.xcconfig in Xcode? How to add custom project configurations to Xcode when using CocoaPods? Why is Cocoapods complaining about the embedded content contains swift setting in the build settings?